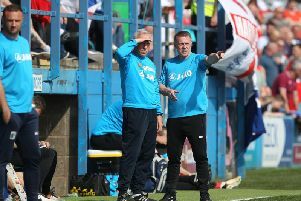 Hartlepool United will be set for a financial boost regardless of whether they win at Gillingham this afternoon. With the FA Cup first round proper set to kick-off this afternoon, clubs up and down the country are eyeing up progression and the financial benefits that come with a cup run. And Pools will no doubt be in a similar position, with the prospect of a further windfall another dangling carrot as Matthew Bates' side look to continue their run in the competition. The FA increased the prize money for the competition this season, meaning Hartlepool have already scooped £25,000 thanks to their victory over Kidsgrove Athletic in the fourth qualifying round. Further financial rewards could be incoming if Pools can find a way past League One Gillingham, too. This season, clubs who are victorious in the first round of the competition will be awarded £36,000 - and such a figure would no doubt be a major boost for Pools. But even if Bates' side lose out at Priestfield this afternoon, they will still be set to scoop some financial reward from the first round tie. FA Cup rules dictate that the away club in any fixture are entitled to 45% of the gate receipts, meaning that 45% of ticket sales for the tie will go to Hartlepool. And while Gillingham confirmed on their club website that they are expecting a 'lower attendance than normal', any money received would be a welcome windfall for the Super 6 Stadium side.